Every time my daughter comes home, she wants to visit the Walker Art Center in the city. Usually, we would take her there before her flight. On her recent trip home, as usual, we ran out of time after playing a round of miniature golf at its sculpture garden; we had to hurry to the airport. BUT I have to take a photo of that cherry! 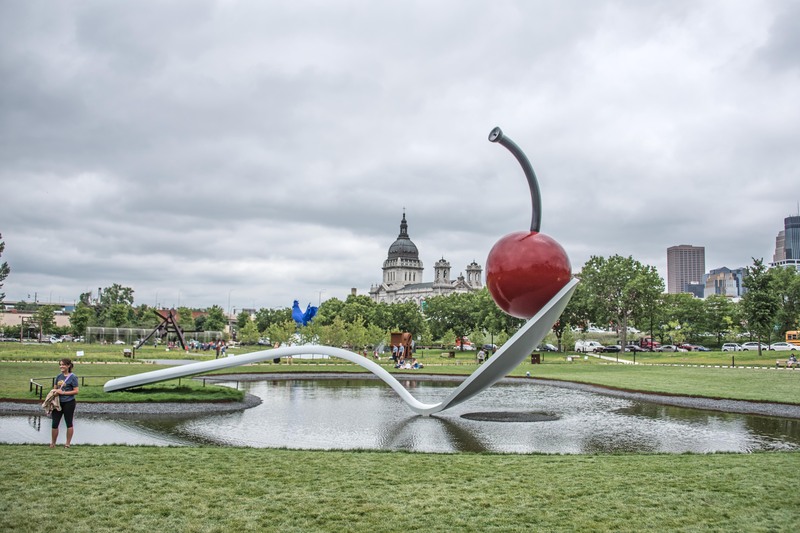 While my husband and daughter kept walking toward the parking lot, I quickly ran toward the cherry sculpture. Since I only had time to take one photo (that was what I thought), I had to make a good shot. My first thought was to get down and use sky as the background. Almost immediately, I rejected that idea because (1) the ground was very wet after the morning rain; I didn’t want to take any chance on getting my paints dirty (2) it would take longer to get down and come up since I had bad knees (3) many photographers had already taken that photo. “No time to think, just click,” I said to myself. So I did. Checking the photo on the monitor, I noticed the cathedral in the background (I have no idea why I didn’t see it before shooting the photo). “Temptation vs. Discipline” came to my mind. I took a deep breath, took time to compose, and clicked again. I knew a woman was included on the bottom left, but I couldn’t wait for her to leave; we had a flight to catch. In Raj’s second comment, he offered some cropping (even though he didn’t use this word) ideas for this photo. I like to document and share my learning progress, so here is the result of my first cropping attempt. I like it much better! (Having the whole spoon in the picture is a plus.) Raj’s first suggestion worked… the lady on the left was gone. Yeah! Next, I thought I would make a square photo. No particular reason… just for fun. It looked pretty good… I got excited! Then, I saw that blue rooster, which is one new sculpture in the garden. Rooster had to go! Finally, portrait mode… like Raj had suggested. I am taking a trip break for 10 days. Wish you all have wonderful summer days and have a lot of fun! I really like the cropping, Helen! I like the last one especially. !Enjoy your trip! Thanks, Amy. It was a good exercise. Each gives a different feeling, which I shouldn’t be surprised, but I did. Oh, I don’t know what happened. Will take a look! I like the first cropping, Helen, because I really like seeing the entire spoon. It think this a pretty wonderful photo. But, you know I am a fan of your photography. Good morning, Lois. I like the first and last. 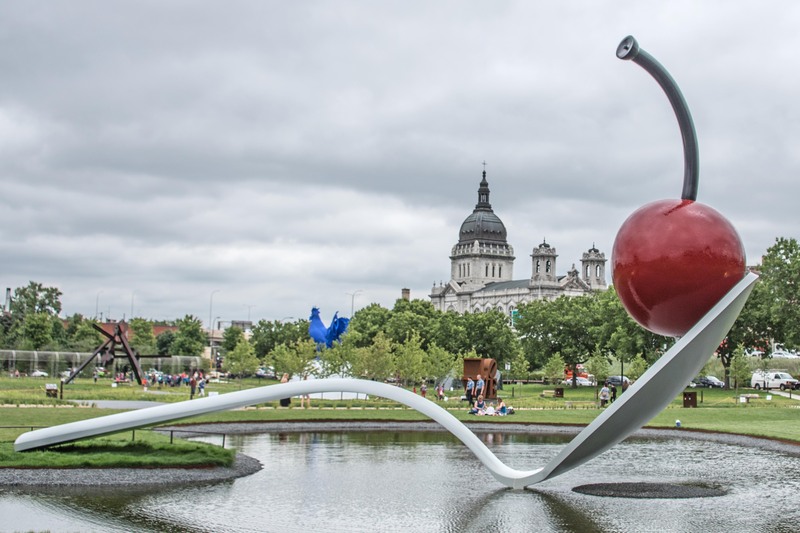 It was hard for me not to show the whole sculpture, since it is a very popular piece and in many people’s minds, it represents Walker Art Center. After reading Raj’s comment, I thought I would give it a try anyway. At the end, I like the last one as much as the first (not more 😉 because it tells a better story. Thank you for being such a dear friend. Have a wonderful day. Thanks, Marie. Your comment pointed out something that I had never thought of. You are so right! Thank you so much! I haven’t been to the Walker in years. Your photos took me back. Oh yes? 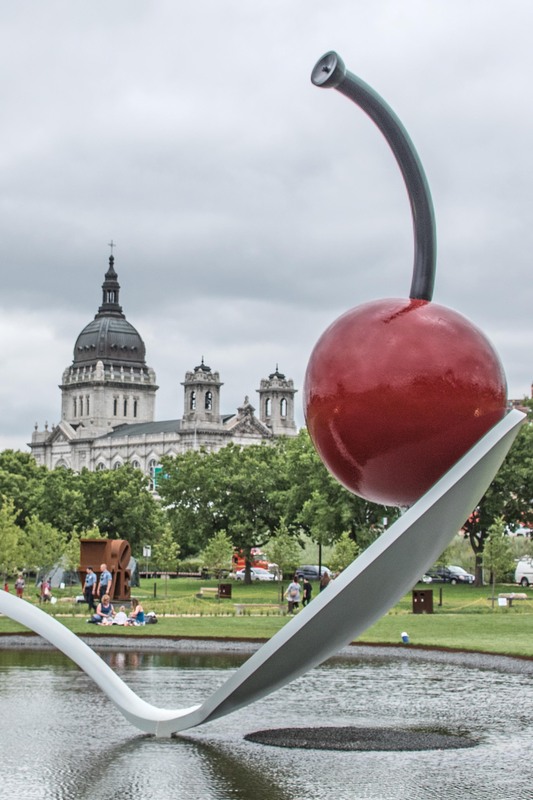 They did a renovation on the sculpture garden last year. 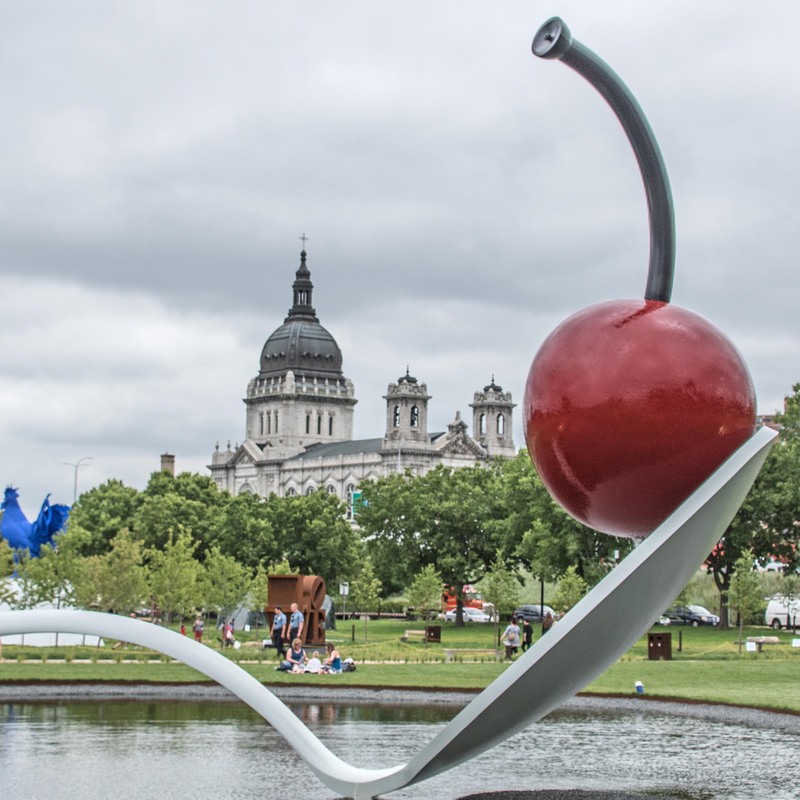 The location of the cherry sculpture is slightly changed. There are also some new sculptures. Blue rooster is one of them. I have to go back to take more photos! Thank you for your comment. Have a wonderful day. Wow Helen, you are workaholic !!! 😁😁 I just suggested and you did a whole post!! wonderful !! You know what? all three looks terrific. Definitely there is no confusion in story-line and unwanted things out of the frame! Great work and I will link this post in my lesson post! Thank you! Workaholic? A lot of IT people are workaholic, don’t you think so? 😉 Good thing I retired. Thank you for your comment. There are so many elements in making a good photo. It’s easy to focus on one and forget others. The last photo does tell the story better — I see it now. Thanks. nice sculpture, beautiful picture and lovely cropping, may I know where this place is? Yes, wish I can go for a visit one day. Thanks and have a nice day! Nice cherry! ^^ Love your photos. They have your humor and warmth. Have a good trip! can’t wait to hear all your good stories. Thank you, Zee. I definitely learned a lesson. It’s all about the story, isn’t it? I reckon the last one. It’s that bird in the middle that detracts from almost the rest of the image. Don’t know about you, but I crop quite often. My images are 512 X 384 pixels, because they load faster. So a Photoshop template and I just paste a whole image in, then move it around to the best position, cut and paste, then process it. Thank you for the information you provided here. That’s definitely a good way to crop. I, on the other hand, often use cropping tool and move the square around to find the right crop that I like. BTW, I don’t seem to get notified of replies etc., from WP blogs (maybe WP banned me ‘cuz I don’t like or use it – and they know it).